If your dog is acting out and having behavior problems, your first response might be to blame them and consider punishment. But poor behavior can often be a sign your pooch is feeling stressed or anxious about something. Check with your veterinarian to rule out any medical causes first. Otherwise, your pet’s stress could be for many reasons, such as a change in your schedule, a move or noise pollution from a busy street nearby. You might not be able to determine exactly what’s bothering them, but including more relaxation techniques throughout your day will go a long way towards helping your puppy relieve tension and get back on track. Classical music is shown to help calm canine moods. A study by the Scottish SPCA and the University of Glasgow played a variety of classical music to dogs in the SPCA’s kennels for one week. The music lowered the dogs’ heart rates and reduced stress-related behavior like standing and barking. The researchers continued their investigation and found that dogs responded even better to reggae and soft rock. The Scottish SPCA now plans to install sound systems throughout their kennels to play Bob Marley and Jon Bon Jovi to their furry residents. In addition, the musician Alianna Boone found that playing harp music to dogs at a Florida veterinary clinic lowered their anxiety. You can buy various products that contain what are known as dog-appeasing pheromones. These are synthetic versions of the hormone nursing mothers make to calm their puppies. Dog-appeasing pheromones have been shown to calm dogs in many stressful situations, such as kenneling, veterinary visits, car travel, human separation and the introduction of puppies into a home. Many dog owners feel their animal friends can laugh when they’re having fun. But science has been slow to agree. Researchers put this to the test at a Spokane kennel, where they played recordings of what’s been identified as dog laugher to the other dogs. Staff at the kennel were surprised how dramatically the dogs quieted and calmed down when listening to the laughter. Many workers have since learned how to imitate a dog’s laugh themselves. They find it really helps to settle anxious or agitated animals. Keeping your dog active is not only important for their health, it’s also known to prevent bad behavior that can result from boredom. Aim for 30-180 minutes of daily exercise. The Bark has a good breakdown of how much exercise is recommended for your particular dog’s breed. Also take your dog’s age, health and general temperament into account when planning their activities. Whatever you do, make sure it’s something you and your dog both enjoy. Active play is a great time to bond with your puppy. Try throwing a ball or stick, have them run next to your bicycle, take them for a swim or go for a relaxing walk. This is another great way to prevent boredom and acting out. Get creative with ways to engage your dog in thoughtful play. Take them to new places. Introduce them to new people and other pets. Get them a new toy, or simply keep your current toys on a rotation so your pooch doesn’t get bored with the same ones day after day. You can also have lots of fun with food. Try hiding treats around your yard or home. Or buy a puzzle toy that has spaces to hide food inside. Another option is to enroll your dog in a training class. Professional dog trainers will give you plenty of ideas for tricks and different games you can teach your pet. A large body of research has proven the benefits of massage for people, including pain and stress reduction, improving circulation, promoting flexibility and eliminating toxins. Very limited research has been done for animals, but it’s logical they would have similar benefits. Giving your dog a massage is also an excellent way to spend some intimate time together and show them you care. 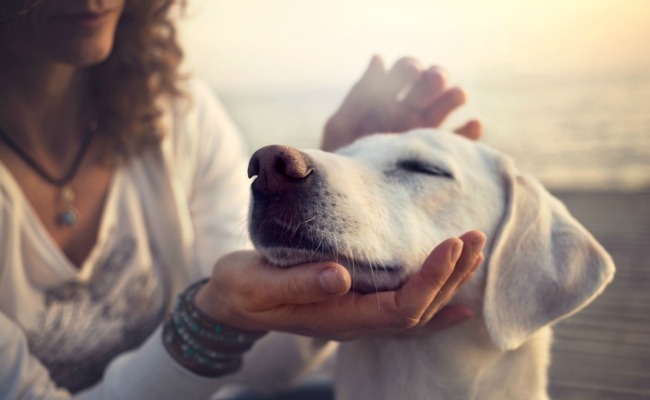 To get started, Modern Dog Magazine has a helpful overview of how to massage your dog. Studies have shown that lavender essential oil can lower a dog’s heart rate and trigger a calming response in their nervous system. It’s also been found to help calm dogs with a history of travel anxiety before a car ride. The best way to expose your dog to lavender oil is to drop some on their mat, blanket or other sleeping surface. Do not apply oil directly on their fur because it can be toxic if ingested. A nice brushing in the evening can be just the thing to help your pooch wind down for the day. It’s also a good chance for you to do a quick inspection for ticks, fleas or skin conditions that might be bothering them. But for some dogs, grooming will only cause more anxiety and stress. If this is the case for your puppy, maybe try some extra snuggling, petting or other attention they enjoy.